Preschool art projects can help a budding Monet or Picasso develop a life-long love of art. Most kids have a great time when a project involves getting messy, and art can be a messy learning experience. You may think that standing at an easel with a paintbrush is great, but your kids may prefer molding creative sculptures with Play-Doh. The great thing about art is that it can take on many different forms, so don't steer your kids away from the art medium they enjoy. Taking your kids to the art section of a store can open your eyes to what they may find intriguing. As you explain the art supplies to your kids, take note of what makes their eyes light up. 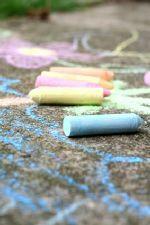 Maybe the thought of sidewalk chalk excites your kids, or perhaps it's the concept of painting a mural. Whatever gets your kids excited about art is what you should explore together. Set time aside during the week for art. Whether it's crayons and colored paper right after lunch or finger paints in the bath every night, you will be more likely to expose your child to various art projects if you make a concerted effort to fit art into your schedule. The Creativity Portal features in-depth descriptions of how to complete many different types of art projects and even has projects related to poetry in case you're looking to expand your child's artistic repertoire. The website for Highlights Magazine showcases the many fun art projects for preschoolers featured in the magazine. This is a great place to find art projects for kids of all ages. The Making Friends website features a wide variety of art projects which can be done using materials you may already have in your house. This is a great site for parents who do not want to spend a fortune stocking their art cabinets. You may be able to find great art classes for your preschoolers, many of which are offered free of charge and which allow the parents to have involvement in the creative process. Libraries often set aside time for preschool art classes, both formal and informal. The time may be spent doing something as simple as scribbling with markers on paper or as intricate as completing an elaborate art project. Libraries are also excellent resources for books on art projects you can do at home with your kids. Art museums usually feature classes for young artists, and many art museums also have spaces set aside for kids to try their hands at creating something artistic. If you have an art museum near you then make it a regular stop in your outings, because it can certainly perk your children's interest in art and give you ideas for future projects. Art and craft supply stores often host art project classes for young children free of charge, and while you're there you can take a look at the supplies you can stock up on for more projects at home. You don't need to buy fancy supplies or research several books to find the best art projects for your preschooler. Instead, grab some interesting objects in your home and ask your kids what they may want to make. A paper plate can turn into a mask. A bag of cotton balls can turn into a snowman. The possibilities are endless when a preschooler is allowed to get creative.